Accordion Worship Music is making a come back! I think I am correct in saying that the BNL band has an accordion player in it. Right? And if that’s correct then that’s the only recording of accordion music I have. Which might seem strange if you know that for generations the accordion was a popular instrument in The Salvation Army. 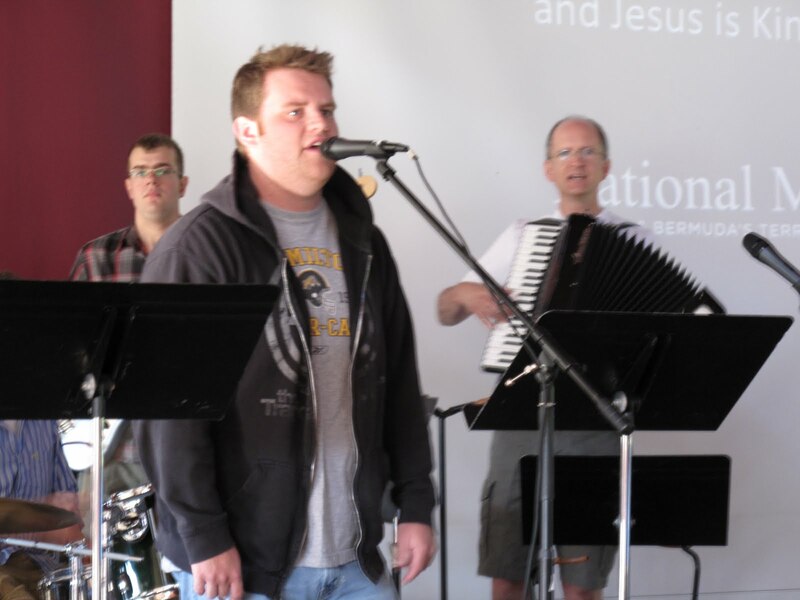 So this morning there was a laugh, and I might add a cheer, when Jamie brought out his accordion for the worship team! And, might I add – they sounded great! Perhaps then I could suggest other corps suggest the inclusion of this portable instrument – no need to amplify it either! The sun was strong this morning and so for the TYI small group we sat in the shade…well I sat partially in the sun. I just am loving the heat and humidity – yes still!! Tonight was talent night at National. Exceptional is the only word I can think of to adequately describe the talent in the room. I suppose I could use “wow”…no matter the word it must describe the depth of the talent in the room. Piano players, violin, flugel horn, bells (and flutes), media…all excellent – exceptional. Truth be told – I wanted to be there. I wanted to take in the evening, to hear some good music to be with good friends. Why not be there? I’m a bit surprised at times – perhaps I should not be but I am at the way in which people view the good things of life. They look at the evening and see time wasted. I see time invested. They see a difficult journey, I see the adventure. They see “the same old song”, I see a reminder of a classic. I shouldn’t be surprised but I am. Tomorrow you and I are going to run into circumstances that perhaps we didn’t really want. Time wasted or invested? Yesterday we had breakfast with Dave and Noelle in Calgary. The conversation was great and it didn’t take us long to catch up on each other’s lives. Part way through breakfast Dave made this statement, “I don’t understand atheists”. Dave speaks frankly and so those kinds of statements don’t surprise me. What delighted me was the expression of his own spiritual journey. He followed that up with, “don’t they understand how good it feels to have faith in your life?’…in fact he went on to say that many Sunday mornings after the service he feels so good about “everything”. Yes – the life of faith isn’t about everything going well, or even avoiding problems, but it is apparent that Dave’s experience gives him a better outlook on life. My experience would echo the same thoughts…my faith changes everything. Yesterday Wendy had her Retired Officers’ Luncheon in Calgary. Gathered in that room were some of the people who have had a strong impact upon my life – I thank God for them all. We made a quick trip back to Edmonton for the Festival of Carols at the Winspear! 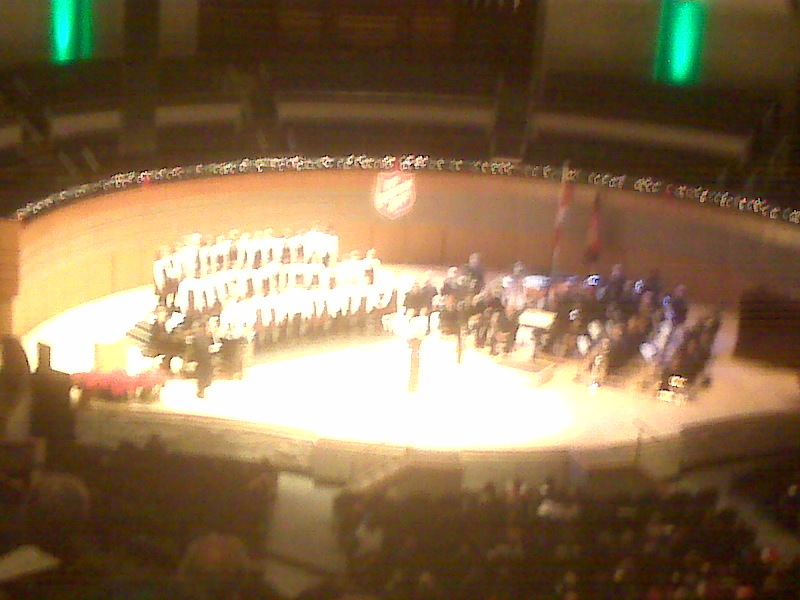 This is not a great photo – off my Blackberry from the third balcony – but it gives some reflection of the children’s choir on the left and the Edmonton Temple band on the right. Both did very well!